Amazon struck the first blow in the Battle of the e-Readers when it released its original Kindle back in 2007. Since then, several generations of the Kindle has been released, but few as popular among genealogists as 2011's Kindle Fire - and later, the Kindle Fire HD. An Android-based tablet with a color touch screen, the Fire is capable of running popular apps (applications), streaming movies, songs, and reading thousands of books. For many genealogists, the Fire has become as indispensable as a laptop - whether working on genealogy at home or on the road, writing family history, or touching base with family across the globe. In this article you'll find a baker's dozen of my favorite ways to use the Kindle Fire for your family history. The Kindle Fire runs runs on Android applications. Apps are similar to the software for your desktop or laptop. Apps are the magic that make everything run. Many apps are free; those that aren't typically cost less than than $10 or $15. Apps are available at Amazon in the Appstore for Androids. The Kindle Fire is, at its heart, an e-reader. And, with more and more Kindle titles using color illustrations or photographs, you'll get a reading experience that's much more like sitting down with a magazine. There are hundreds of Kindle titles for genealogy (including several by this author). Many are priced under $10, some no more than $0.99, and others are free. 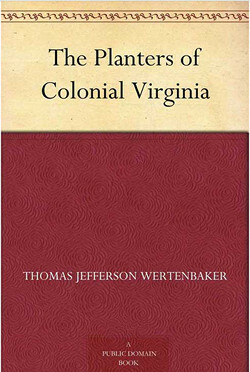 Some of my most surprising genealogy finds have come from free history books on the Kindle, such as The Planters of Colonial Virginia and Colonial Records of Virginia. To find these free titles, search the Kindle Store for search phrases like free virginia books for kindle or free history books for kindle. Have you uploaded a GEDCOM to Ancestry? If so, grab the free Ancestry app. Once installed, log into your account to access your family trees. The next time you're visiting family and someone asks you about an ancestor - or if you can't remember a date - use your Kindle Fire to access the entire family tree. Want to talk to or interview a family member across town or across the country? Skype for Kindle Fire HD comes preinstalled on your device. Use it to talk long-distance with family and friends. I use Skype to talk to my brother in Florida, my friends in Washington state, and my nieces in New York. Skype for the Kindle Fire works the same as Skype for your desktop computer; just add your family member to your contact list and tap to talk. 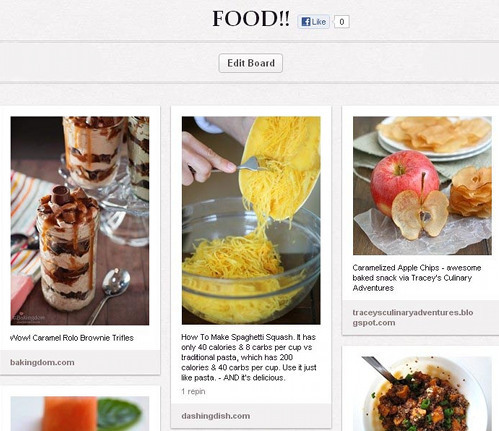 Pinterest is one of the Internet's fastest growing social networks. It's a free service that allows users to create virtual bulletin boards to which images can be "pinned." Create boards for online discoveries like genealogy books, hometowns, maps, family recipes, or old photos. Then, as you find images while Web-surfing, pin them to the appropriate boards. Pinterest offers genealogists a great way to organize items, plan trips, and share hobbies. Want some inspiration? Search Pinterest for genealogy, DIY, and food. 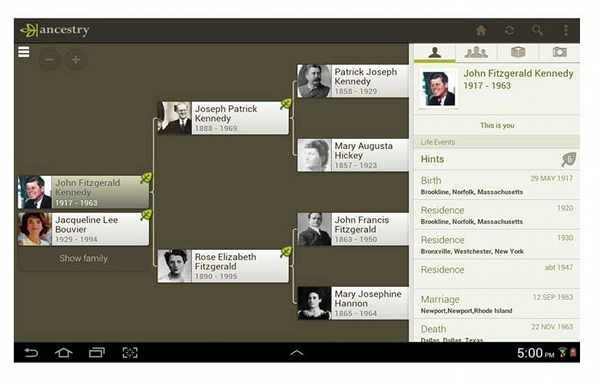 Evernote, a free app, is a must for genealogy researchers. Evernote syncs with your online notebooks, giving you access to all of the Websites or articles you've stashed online. If you're offline, you can still access your Evernote notebooks that were stored since your last sync. You can even add new notes or edit old ones and they will sync the next time you're connected to the Internet. For those of us who are writing about our family tree, we can also use Evernote for writing drafts or outlining. Facebook and Twitter are favorites for genealogists and both apps are free. Using the free Facebook app, you can share photos, events, research notes, jokes, and just plain chit-chat with distant relatives. Facebook is a great place to announce family tree discoveries or new research ideas. Twitter is one of my favorite places to network with other family tree researchers. It's amazing how much genealogy-talk you can get into 140 characters! Are you a blogger who uses the WordPress platform? If so, blog on-the-go with the free WordPress app for the Kindle Fire. The dashboard layout is simplified so you can edit post content in either landscape or portrait mode, add media, view stats, comments, and notifications. A great choice if you do a lot of blogging away from home. I guarantee that you'll run into genealogy-related PDF documents online. And although the Kindle Fire comes with a PDF reader, many people choose to install the free (and more robust) Adobe Reader. Using Reader, you can read your PDF file in various modes (such as continuous, single page and automatic), search within a PDF, and send the PDF as an email attachment. Astrid Task & Todo List is a free app that has reminders, syncing capability and the ability to create tasks and sub-tasks. Astrid will even remind you of items on your to-do list. 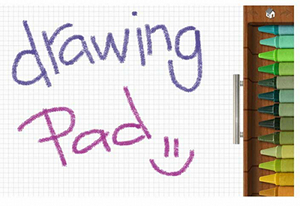 Drawing Pad ($1.99) is a whiteboard kind of app that has virtual pens, pencils, paints, markers, and stickers. I like using a drawing app to jot down quick directions or a note to remind myself of something. It's also a way to keep the kids busy when you're driving around town. Drawings can be saved and shared via Facebook and Twitter or sent via email. For me, Dropbox is a must-have app. Dropbox is a free file-syncing service that allows you to access files (photos, music, documents, video, etc) from your Dropbox cloud account, then pull them into your Kindle Fire. I store important documents in Dropbox then pull them into my device when I need them. Documents in the cloud auto-sync with the Kindle Dropbox app. I use this free app every day. With Flipboard you can pull your social network feeds and updates from your favorite blogs into a virtual magazine style environment. Not only can you read the latest from your Facebook or Twitter feed, you can also use Flipboard to pull in the latest articles from your favorite genealogy blogs. Hands-down, I think Flipboard is the best digital magazine app available. Did you find a great article online but didn't have time to read it? Not a problem as Pocket (formerly known as Read It Later) is an e-reader that adds Web pages to your reading list so you can read them later when you're offline or whenever you don't have a Wi-Fi signal. Pocket docs can be read on any device that has the app installed. The apps and uses included in this article are only a fraction of what's available for your Kindle Fire. With the ability to save massive amounts of family tree data on a small, portable device, the Kindle Fire is a winner for mobile genealogists.